This small museum's most famous attraction is the 600-year-old frozen body of Juanita, the young Inca girl who was discovered in near-perfect condition on top of the Ampato Volcano in 1995. She was killed as a sacrificial offering to the mountain gods and buried in a tomb with a number of funeral offerings that are also on display in the museum, along with other ice mummies found on the mountain. The body was encased in ice and preserved by the freezing temperatures on the 20,000-foot (6,000m) peak for hundreds of years, and was found after a volcanic eruption melted the ice and exposed the tomb. The Ice Maiden is displayed in a refrigerated glass case, and analysis of her DNA has afforded great insights into the Inca culture. An interesting video documents the discovery and is included as part of the compulsory tour. These amazing mummies are certainly reason enough to visit the museum, but there are other interesting artefacts, gathered at archaeological sites in the surrounding mountains, on show as well. Juanita is not always on display - every year the body undergoes restoration - but another maiden takes her place in the collection. 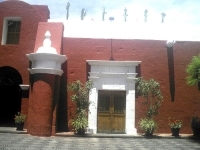 The museum is located very near the Plaza des Armas in Arequipa, in the historic area of the city.